We have received several questions from bloggers participating in the Holiday Gift Giveaway Hop on how to get a link BEFORE you publish your post. I didn’t realize that you could do this with Blogger until I talked to Cindi from Little Yayas. She has taken the time to give instructions on how to do this. Thanks Cindi! There are times when we would like to have have a url link to a post that we don’t have published on our blogs yet. 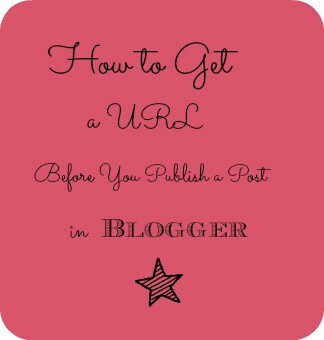 You can require a url link previous to being published for several reasons. For example, I am participating in the upcoming Holiday Gift Giveaway Blog Hop and would like to have my giveaway url in the link list with all the other blog links. This will keep them organized and make sure that all the links go live at the same time. BUT I don’t want to publish my post early and I don’t want people to see it before the event starts. This is what I have done and it has works great. Step 1) WRITE YOUR TITLE. You can write your post if you like, but you don’t have to. Just as long as you have the title. You could writing “Coming Soon” in the text body. Step 3) Grab your URL. You can copy it and paste it on a page you can save and have access to it. Step 4) EDIT that post. You will click on EDIT just like you were going to edit your post, only now you are going to click on SAVE AS DRAFT. Step 5) SAVED. 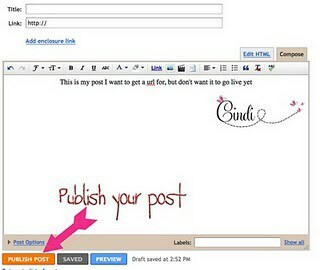 This will save it with all your published and unpublished posts. THEN you can SCHEDULE your post to go live at a future time and you are DONE! This will help you get a url link in blogger without having your post be active. What a great tip! I have wondered about that. I was JUST wondering about this! Thanks! Thanks! This is something I have ALWAYS wondered about. This also explains why I have posts that show up in my reader that I’m not able to click over to, but they will show up again later. Anyone know,does it work for WordPress too? Yes its easy for WordPress. When you are putting in your post you will see the link under where you put the title in. Thanks Stacie. You’re awesome – blog and your helpfulness! Brilliant! So handy to know. Thanks for posting this! I have been trying to figure out how to do this to in order to get a tiny url for my giveaways…Thanks So Much!
? when I hit publish post, won’t it show up on my networked blog page, twitter account and anyone’s blog roll that lists my site? Yes, it will but you can delete it from your networked blogs and twitter stream. This is good to know but won’t everyone subscribed get that title then? Yes, but there’s no way around that unfortunately. Stacie this is such a great tip. I read it and had one of those, “Oh..DUH!” moments, but, honestly. if I was crushed for time and trying to get a link it is probably the last thing I would have thought of! This is one of the best tips I’ve ever read…thanks for sharing. I bookmarked the page, and I’m off to tweet this now! This is a great idea. I have WP and I could have used this tip this morning! Stopping by from the StumbleUpon group and following you via GFC now. Have a great weekend. I just switched to wordpress, but this is great info for those using blogger. I really am glad I started with blogger though, it was always so user friendly. Does it matter that when I save my post as a draft now, in January, the URL has a piece that reads 2011/01…If I schedule to post in February, won’t it list it as 2011/02 thus changing the URL from when I saved it? Making the URL not work? Hope this isn’t a dumb question!! Little Yayas wrote this post so I will fwd your q to her and let you know! I was wondering the SAME thing, please let me know if you found the answer! This is fantastic. I just tried it for the Valentine handmade giveaway and it worked! I’ve tried to do this before, but thanks for the info. Clicking “Save as Draft” before posting makes all the difference. 😉 Thanks! Thanks – I need to know this for the Fall Festival Giveaway! I love how information on the internet is stored forever. Thanks for this post! I was just dealing with this problem when trying to release a short story in parts. I wanted to schedule the posts to publish every four days, but I also wanted to be able to say, “This is Part Three, to read Part Two, Click Here.” And so this post helped with that. However, I think I’ve discovered a better way. There is a tab below Schedule in Blogger called Permalink, and if you just click that it will tell you what the URL of a specific post will be.